So I have this room. It's my master bedroom, and it's not going to be renovated for quite some time. Bottom line, we have rooms we don't love that we have to live with, and we need some strategies to survive the wait until they make the top of the list. Because I don't know about you, but I can't spend year after year sleeping in a room that looks like a dive motel and feel good when I wake up in the morning. So, usually the advice in situations like this is to paint. "Just paint!" they say, enthusiastically. "You can completely transform a room with a simple coat of paint!" they crow. Ok, I'm already exhausted and we haven't even painted the dern walls yet. And let's not forget about how the fresh new paint is going to make everything else in the room look dingy and dirty and depressing. Painting isn't a "quick fix." At least not for me. Here's some strategies to perk up a room that actually only take about 20 minutes. A little sparkle can make any room feel better. For this room, I chose to add a little chandelier that I already had. It had brown accent crystals, so I ordered some pink ones on eBay to replace them and spent about 20 minutes changing some of them out. I love it. Adding some of your favorite colors to a room can really help it feel more like home while you're waiting for the big renovation. The trick when doing this is to modify your colors just a touch so that they blend well with the existing room. For example, since this room is painted and carpeted in beige, which is a dirty color, my usual pink and orange became mauve and coral, with cream accents to blend it in. If I had added clean colors (my personal favorite) it would have made the room look even dingier. Adding art and accessories is a great way to add personality to a room and draw your eye away from the things you don't love. But don't invest it any "final" pieces, since it will be hard to predict how the items will work once the room is redone in your new color palette. Just pick up some thrifted things for a couple of bucks each and prop them up on a ledge or shelf. Here I'm trying out some different art, frames and pottery to see how I like it. And since it's on a ledge and nothing was more than $1, I can change it out as often as I want to. That isn't to say you shouldn't buy things! 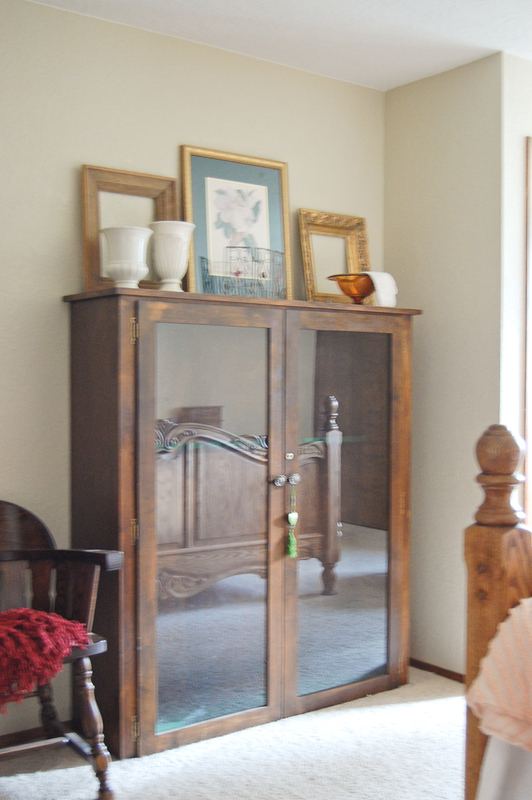 As you find great pieces for the room, go ahead and collect them. This is especially true of furniture items you intend to paint or refinish because you can work on space planning and placement even if the room isn't the right color (assuming you're not going to be completely changing the layout of the room in the future. And again, if you thrift your furniture, it's not a huge investment if you change your mind. 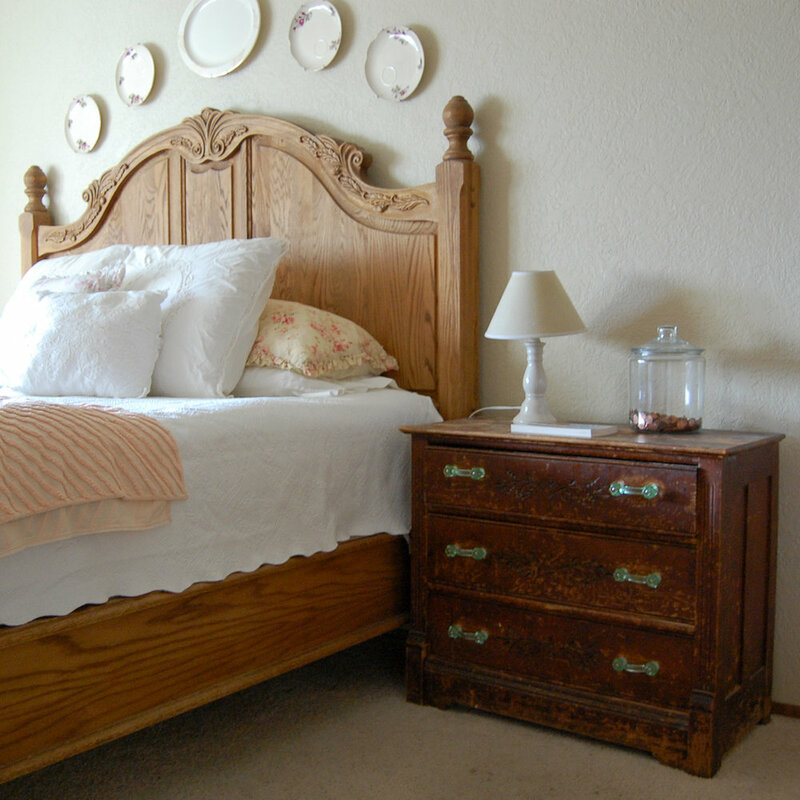 For example, in my room I've collected this antique dresser to use as a nightstand and put vintage green class handles on it. Of course, every room benefits from being cozy, in whatever way that means to you. If it has a place to cuddle or snuggle or curl up with a book or kid or kitty, it's probably a winner. Our memories and experiences affect our feelings about a room, so look for opportunities for happy experiences in the room and you may find the decor doesn't bother you nearly as much. In this room, I chose to add layers of vintage linens and spreads so the bed was inviting to all (our cat is demonstrating for us). Is this room perfect? Is it exactly the way I want it? No, of course not. But it's cozy and soft and has some personality, and it has plenty of places to cuddle and a little color and sparkle. It's definitely enough to make do until we can get around to doing this room "to the nines." 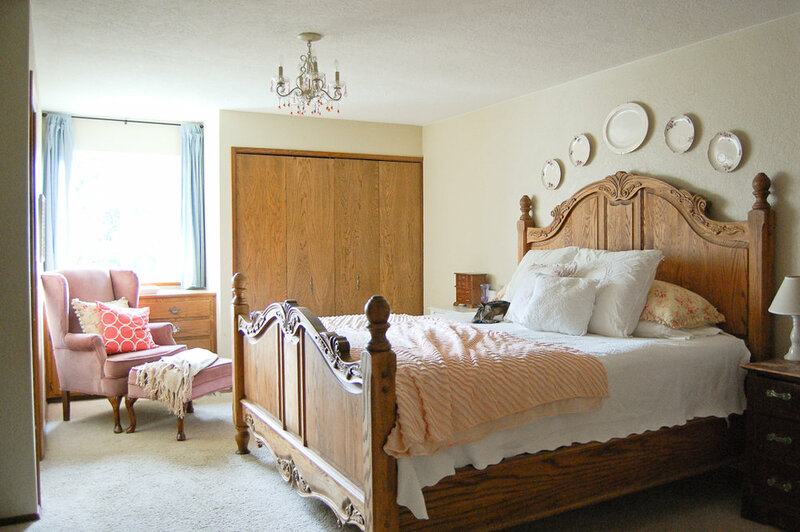 Here's a side-by-side of the original master bedroom before we moved in, and the room now. Do you have a room that you need to make do? What are you doing to make it work for you?